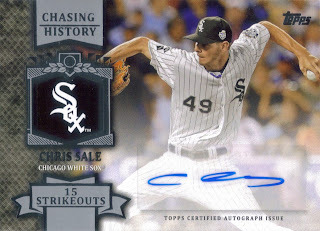 Last year, when I picked up a few packs of 2012 Panini Cooperstown, I was really impressed. For a product that does not have a MLB license, they really made it look sharp. This year's offering is no different. The cards are very sharp and they are of a subject that I really enjoy. I actually busted a box of Cooperstown today. I had a choice of A&G and Cooperstown and I actually chose Cooperstown. I will probably pull out some notable cards in the future, but I really wanted to take today to showcase the 'hit' of the box. 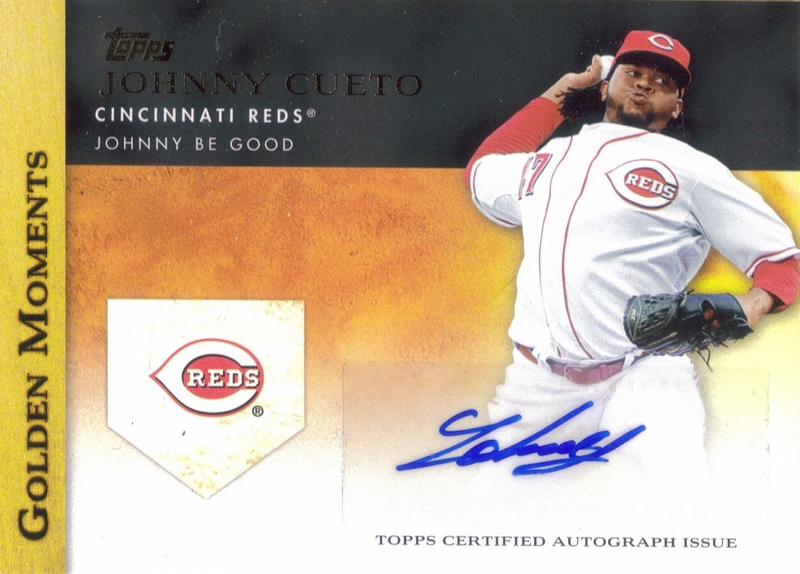 The hobby box boasts only one hit and it is a promise of an on card HOF auto. Well, as you can see above, the auto was Paul Molitor. The card looks great. His signature really pops off of the card. I like the black and white background, and the design of the auto area is really nice. 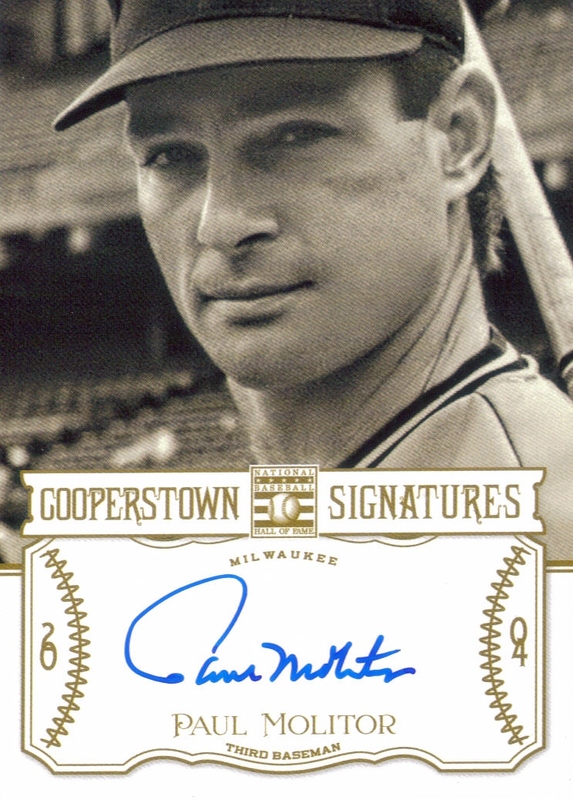 I actually traded away a Molitor auto the other day, so I was happy to add one back to my collection this quickly. 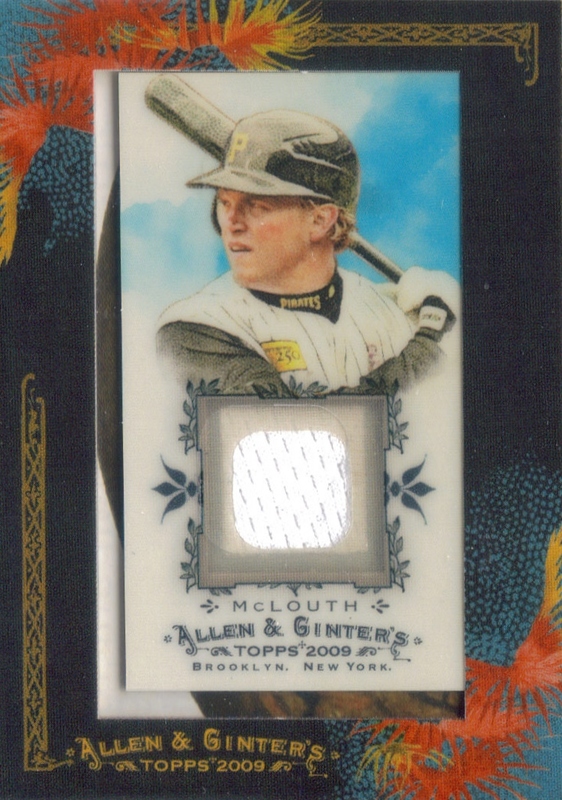 In all, I was really happy with 2013 Panini Cooperstown. I don't know if I will pursue the set or will just break up the cards to send to other bloggers. We'll see, but for now, I am just enjoying them. I know I will add the Molitor to my collection and will not plan on trading or selling it. 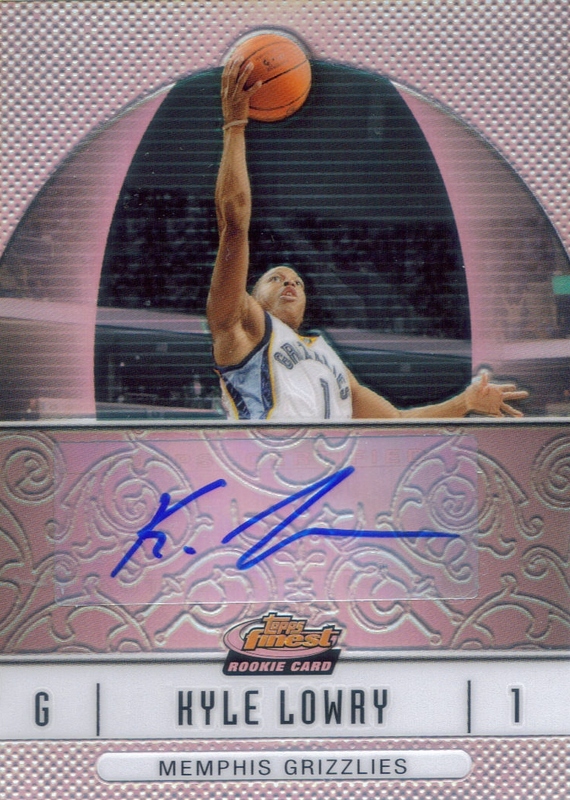 I just completed a trade with a fellow blogger (which I will detail when my end of the trade comes in), but in order to do so, I had to scan several of my autographed cards that I had available. Well, of the 10 cards I scanned, he took 6, so I had four cards left over that I had scanned. This serves as an added benefit for the trade. I now have 4 autographed cards that I scanned (and pulled out of the recesses of my sale box) that I can post on my trade page and blog to gauge interest and try to flip for other things. I meant to do that.... Yeah, ok, right. So, these have been added to my Trade Page, which you can click on just below my blog banner. You can see it. Go ahead, click on it. If anyone is interested in any of these, please let me know and we can try to work out a deal. If I can move these, maybe I'll continue to dip into this stack of autos I have and keep this a regular thing. I have to see folks showing interest, though. Yeah, I'm not happy. I have every right not to be. 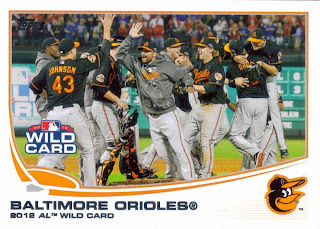 I have sat here and watched the Orioles for 20+ years, only to be rewarded for 3 of those seasons. Last year felt so good to see the team come together, fight and never give up. They played with pure heart. This season's team? Not so much. Jim Johnson has been wildly inconsistent. Nick Markakis can't buy an extra base hit, let alone in the clutch. Adam Jones is no leader. Yeah, I said it. He can be a leader when he stops swinging at low and away pitches 2 feet out of the strike zone with no outs and a runner on third. Yeah, this season has had enjoyable parts. Watching Orange Crush chase the HR record (of 61 homers) has been fun, but he likely will come up short, but 50+ will still be nice. Manny Machado has cemented himself as a future star among the likes of Bryce Harper and Mike Trout. The Orioles pitching has been crap this year, save for Chris Tillman. Dylan Bundy had Tommy John surgery and is likely out til at least July, if not August next year. Brian Matusz is so soft between the ears, he has no hope of being a legitimate top of the rotation start like he was billed when he was drafted with the 4th overall pick in 2010. Kevin Gausman has been a disappointment. At least to me. He hasn't shown me anything special. So, it is time for me to divest myself from this season and to stop living and dying with every game. I'll check the box score from time to time, but I can't take much more of this joke of a 'team' playing well below what they are capable. I can finally sew Chris's patches on his Cub Scout uniform, hopefully in time for the first meet. I can work on catching up on some mail to fellow bloggers. I can organize my cards. I can send a batch of cards to COMC. I can begin researching and sending out more TTMs. I can wear the ECU hat that my brother got me, but I haven't worn due to some suspicion that I have to wear an O's hat every day during the season. I can get to bed early every night. I can let my wife watch what she wants on the living room TV. I can let Chris check out the Giants scores on my MLB App. I can organize my card room. Yeah, it'll feel good to step away, which I definitely will be doing. For all of you whose teams haven't locked their heart in the cabinet under the sink, I say good luck to you in the playoffs. I'll probably be pulling for the Cardinals and Pirates. As school resumes today (at least around here), I want to reflect on some leftovers from my vacation. When we went to Cooperstown, one of the vendors gave me a free signed baseball for purchasing so much from him. I had a choice of several faded autographs, and settled on the above Jim 'Mudcat' Grant signed ball. As you can see, it is faded pretty severely, but since it was free, I definitely am not going to complain. I have been wanting to send TTM to Grant, and now, this ball makes that unnecessary. Chris also got a free Boog Powell signed baseball from the same guy, which was really nice, since he gave it to him right after he walked in the door, prompting me to seriously consider buying some of his wares (which I did, of course). Jim 'Mudcat' Grant (b. 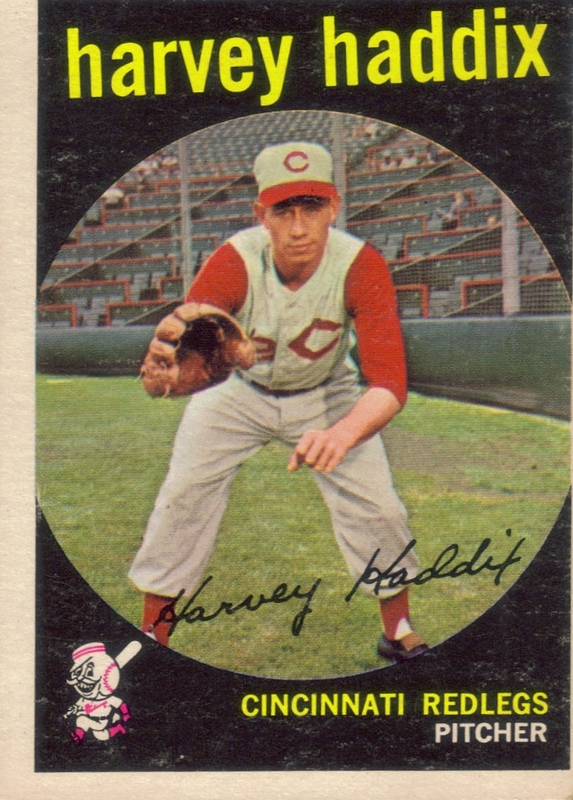 1935) played in the majors from 1958 to 1971 for the Indians, Twins, Dodgers, Expos, Cardinals, A's and Pirates. He had a career record of 145-119, 1,267 strikeouts and an ERA of 3.63. 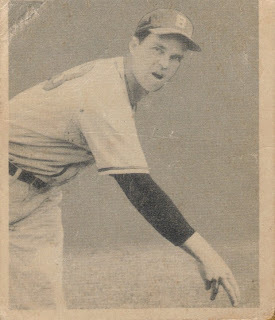 His best season was in 1965 with the Twins when he was 21-7 with a 3.30 ERA, 6 shutouts and 142 strikeouts. 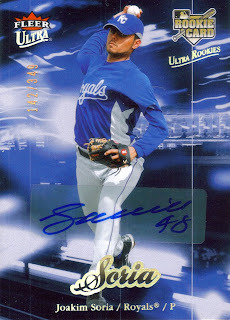 He was an All Star that season and finished 6th in the AL MVP voting (the year Zoilo Versalles won). He didn't win the Cy Young Award that year since it was still shared by both leagues and Sandy Koufax won with all 20 votes. He went 2-1 during the 1965 World Series which the Twins lost to the Dodgers. 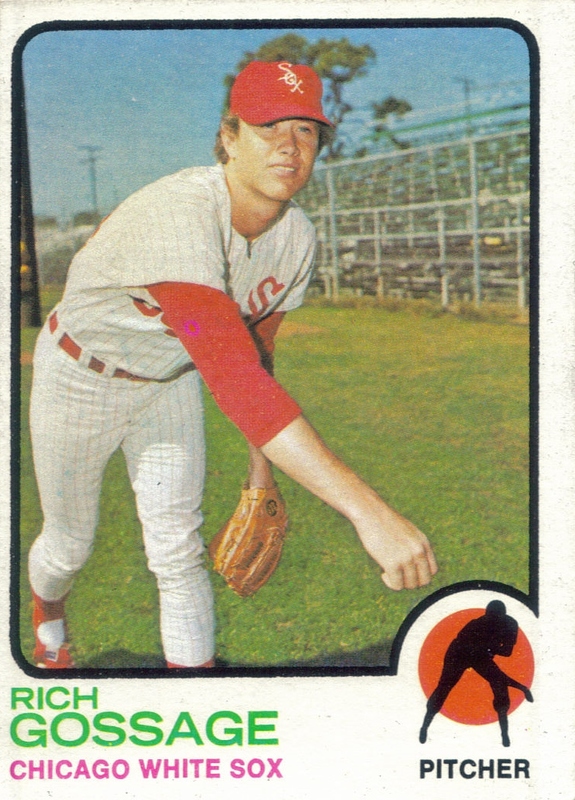 He also appeared in the 1971 ALCS with the A's, but he likely got a ring from the Pirates since he played 42 games for them, garnering 7 saves in the process. 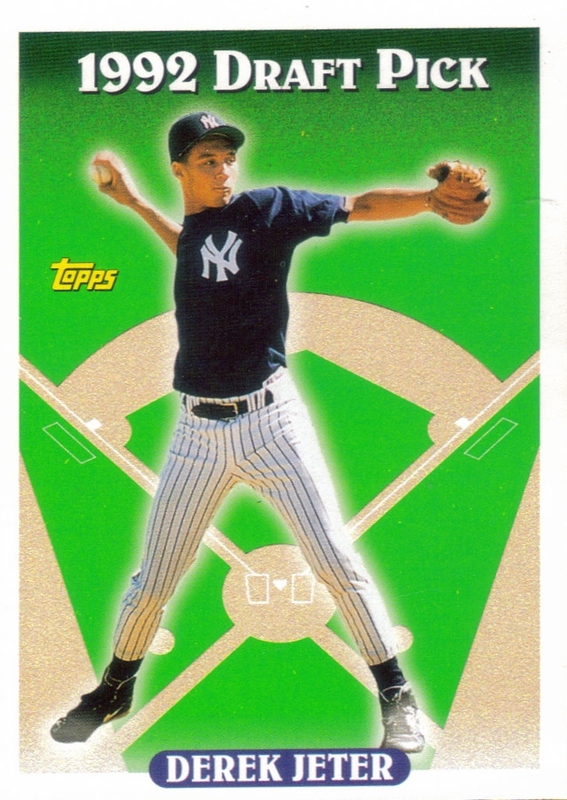 He was purchased from the Pirates by the A's on August 10 of that year, thus missing a chance to pitch in another World Series. Sadly, I only knocked off one new ballpark that I hadn't been to this year when I went with Chris and my brother, Adam to Frederick, Maryland. We hit Frederick on our way back from Drew's place, figuring we could stretch out our vacation another day by taking in a minor league game. I also had a free hotel night with my Choice Rewards, so we got to stay there without dipping into my already stretched beyond recognition vacation budget. Harry Grove Stadium is a pretty nice place. It reminded me a lot of the park in Bowie, MD and also the park in Hickory, NC. I really enjoyed the orange seats, though. Chris had a great time. We met friend of the blog, Matt Hobgood, former Orioles first round draft pick. He also got to go down on the field in the third inning and take part in an on-field contest with his uncle Adam. They lost the contest, but I was able to get them both on a really grainy video with my phone. By the way, I got a smart phone in May and I'm loving it. I am still getting used to apps and stuff, but being able to blog while riding in the car was really awesome. Yeah, pretty grainy, but it works. The coolest thing that happened, though, was before the game even started. One of the employees came over and asked Chris if he wanted to be the day's "Play Ball" kid. He said yes without even knowing what it was, but she told him that he would be brought down on the field during the National Anthem and would yell play ball into the microphone to start the game. AWESOME! Chris did a great job. I thought this was one of the coolest things he was able to do at a game. He's gotten free stuff from tons of players before, but I think he really enjoyed being on the field with them and yelling play ball. Adam was a bit disappointed that the Orioles had promoted former South Carolina Gamecock, Christian Walker to Bowie a few days before the game. Adam is a big SC fan, so that would have been cool to get to see Walker play. The game was really good, Adam and I enjoyed a few Natty Bohs and some hot dogs. We really enjoyed ourselves, even though the Keys lost. So, I guess I'll try to knock out a few more minor league stadiums next year since I didn't get to too many games this year. Oh well, we still had a great summer and an awesome vacation. I got a nice package from Weston over at "Fantastic Catch" recently. He put in a bunch of Orioles and some Panini Cooperstown cards. 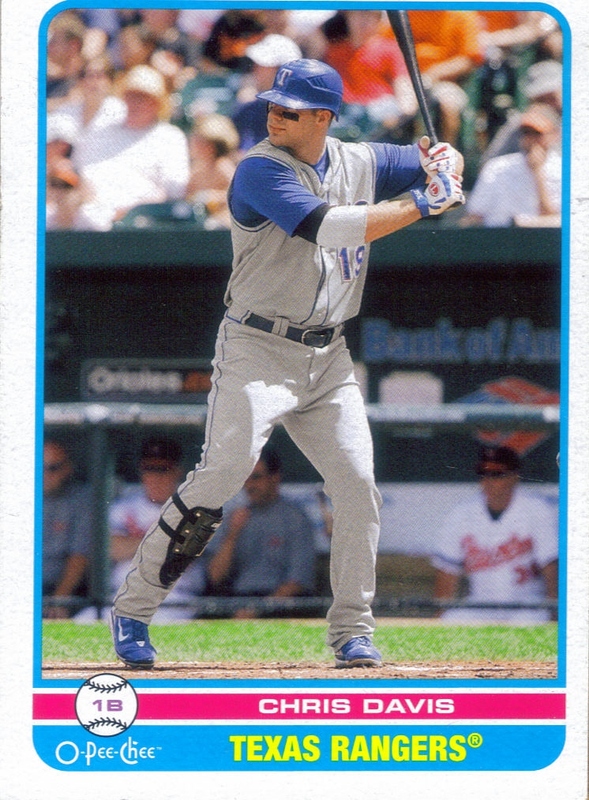 I really liked the 2009 O Pee Chee Chris Davis (above), which I didn't have for some reason. 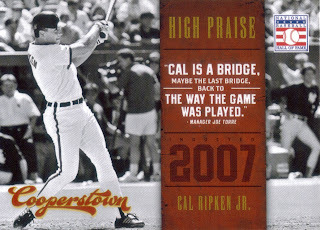 Weston also included this Cal Ripken that I didn't have yet. Speaking of Cal, he turned 53 today. Wow, I'm feelig old. Thanks for the package, Weston! I really enjoyed the cards! I got an email recently from Tom over at "Angels in Order" saying that he had a few cards for me that would fit into my set needs. 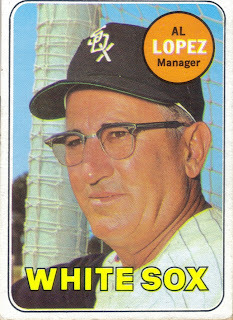 He emailed me the card numbers, but when I got them, I didn't realize that the two 1969 Topps cards he had were the above Hall of Famer, Al Lopez and the below Jim "Mudcat" Grant. I actually have a post I am planning on doing concerning Grant. I always forget that Lopez is a Hall of Famer, so I will likely be getting one of his signed baseballs sometime soon. 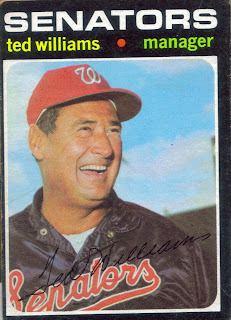 These are definitely some nice 1969 Topps cards, that's for sure. Check out the airbrushing on Grant's hat. I need to get over to Tom's blog and try to knock out some of his needs, especially since he sent me this stuff uncolicited, which I really enjoy. Not only did Tom send me these two 1969s that I needed, but he also sent me 3 2013 Topps Emeralds for that set as well. Thanks so much, Tom! 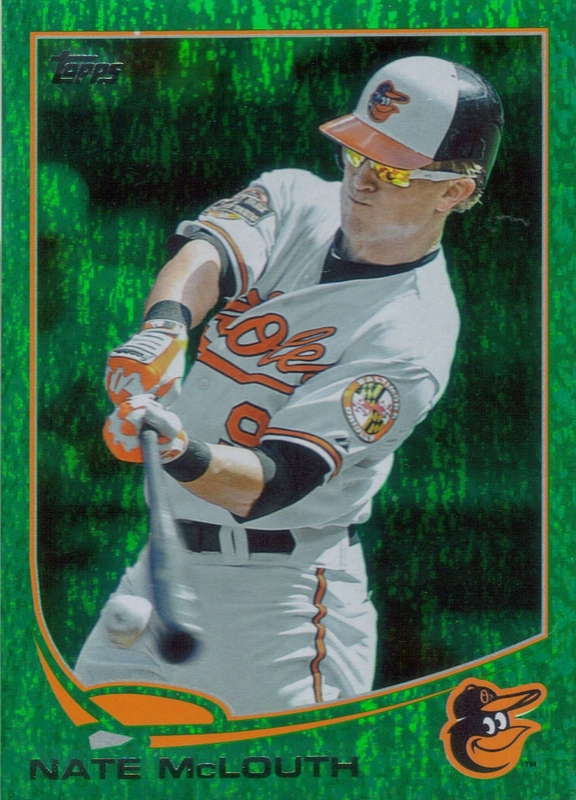 I recently completed another trade with Brian from the blog "Base Set Calling" when I sent him some 2013 Topps parallels (a black and a camo) for the above 1959 Topps Harry Bright, the below Chris Davis 2013 Topps Stickers and two 2013 Topps Emerald parallels that I needed. I really like getting these random 1959 Topps guys. All of the cards look really cool, with the colored frame around their portrait. I think most of the cards scan really well. There are several which I would consider some of the nicest looking for any baseball card in history (the Ernie Banks comes to mind). I don't know how I missed these Topps Stickers. 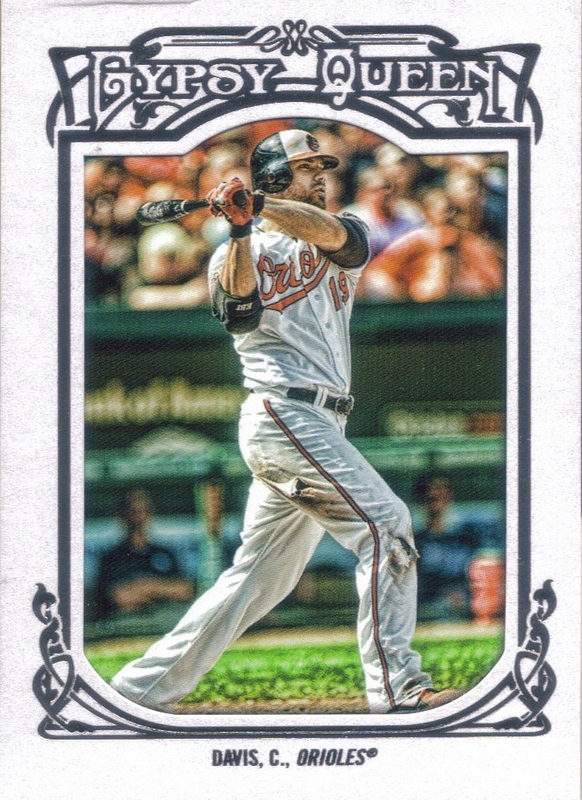 Well, maybe I do, I tend to stay away from them, but this Chris Davis looks really cool. I'm all for adding stuff to my 'Orange Crush' PC. Thanks for the trade, Brian! I hope we can do that again soon! I am slowly catching up on my mail from the last few weeks and todays post covers a sweet package I got recently from Roger over at "I Don't Know, 3rd Base..." I had sent him several Tigers cards and in return, he sent me a ton of Orioles stuff as well as some Series 2 Emerald Parallels. 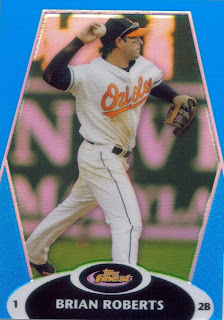 It is really hard to believe that I didn't already have the above Brian Roberts blue refractor from 2008 Finest. Those are some really nice looking cards, I think. It is numbered 49/299, not bad! 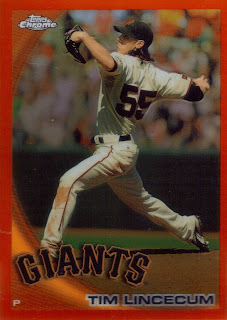 I really liked this 2010 Topps Chrome Tim Lincecum orange parallel. I guess Chris will get it in his collection eventually, but for now, I think I will enjoy it myself. Finally, Roger sent me 23 Series 2 emerald parallels. I should be coming along nicely on this set. I really hope to be able to sit down and sort and catalog my needs. I've been saying it for a while, but I think it really needs to happen. So, thanks again for the trade, Roger! I'll continue to keep an eye out for Tigers stuff. Also, as far as the trade you proposed in your note, please shoot me an email and we can discuss. 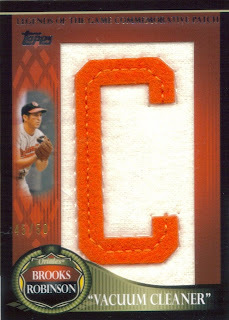 I am so close to finishing up my 2009 Topps Legends of the Game Brooks Robinson patch set. 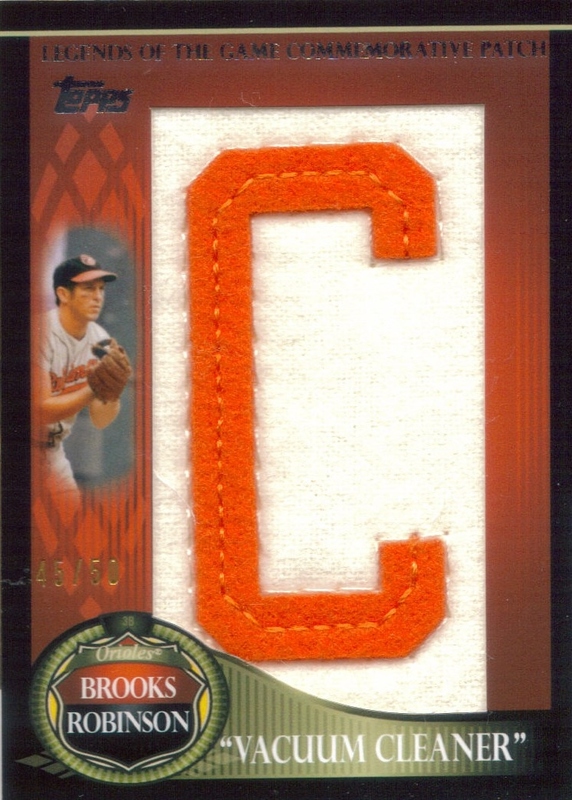 I never thought it would take this long, but I am down to two letters now that I picked up this 'C' from Ebay. All I need now are the letters 'A' and 'R' and I will have spelled out Vacuum Cleaner (Brooks's nickname). I will feel very gratified once I am able to complete this set. It has been one of the toughest that I have ever worked on. Maybe not cost-wise, but actual card availability. They were all over the place back in 2009 when the set first came out, but now, they are near impossible to find. So, if any of you see an A or an R from the set, please let me know! 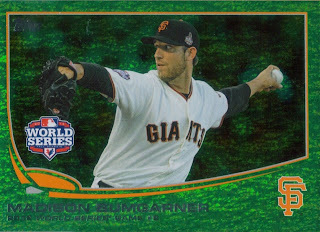 Judson was nice enough to send me a huge stack of 2913 Topps Emerald recently (of which I needed many). I have slowed down on working on this set. I really need to pick it up. I have to organize and catalog the Series 2 Emeralds that I need for my set, so that folks can pull them off of my wishlist. Check out Judson's blog, My Cardboard Habit, for a good read written by a Rangers fan. 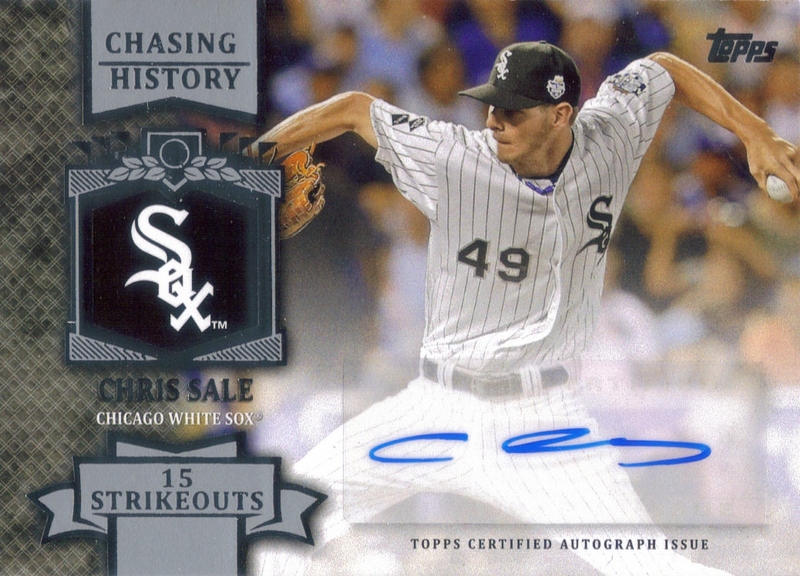 He has been busting Allen & Ginter right now, so definitely check that out. My wishlist will be updated for my Series One emerald needs and I hope to get my Series Two stuff organized by Sunday evening. We'll see. Please be sure to check it out, nonetheless. I got a trade package in the mail last week from blogger, Ken, who hasn't posted much lately due to some health problems. I have checked in on him lately to make sure he is doing ok (he seems to be) and I have sent him some Indians cards to keep him in cards while he has been holed up at home. 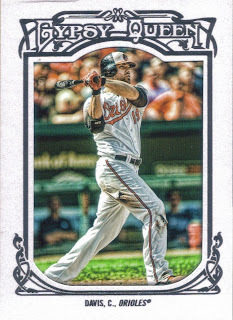 In return, Ken recently sent me a stack of Orioles cards, featuring the above Chris Davis Gypsy Queen White Paper parallel. This is a really awesome card and with as great as Davis has been lately, I am really happy to have it. If you haven't had a chance, head over and take a look at Ken's blog. Maybe he will be able to post again soon! I was able to meet another blogger while I was up at Drew's, his good friend Schuyler. Schuyler's a great guy who i always try to send Christy Mathewson and Team USA stuff to. We met him at his family's bookstore, Merritt Books in Millbrook, NY (there website is: www.merrittbooks.com). I gave him some stuff from our HOF trip and he gave me a few Orioles cards from 2013 Topps. I'm hoping Schuyler will start posting again on his blog, as well. It was really awesome being able to meet Schuyler in person. I'm really digging these in person trades. I hope I can keep doing them in the near future! 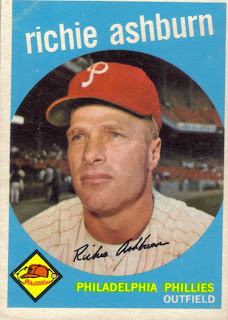 I am sensing a Richie Ashburn theme for this card show. The Ashburn was in a 75% off bin, so they guy sold it to me 75% off the BV of $30, or $7.50. I got 14 total 1959 Topps cards and spent less than $20 on them, so I feel like I did really well there, too. 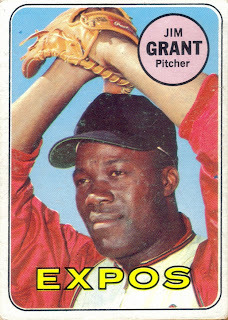 Finally, I knocked out 9 total 1971 Topps cards. These were a bit more expensive since I need high numbers and the majority of these were Hall of Famers. I was able to get: Frank Robinson, Billy Williams, Rollie Fingers, Mets team card, Jim Bunning, Tony Perez, Jim Fairey, Ken Rudolph and Dave McNally. I would really love to finish off 1971 by the end of the year. I think it can be done pretty easily, I just need to spend a little money on those high numbers. I'm going to be skipping around quite a bit now to try to catch up on some long overdue posts, but first, I wanted to show what I picked up this past Saturday at the Charlotte card show. I had no idea that there was a card show scheduled to be in Charlotte the very same time that I was heading that way to visit the in-laws, but as luck would have it, there was, indeed a show scheduled. So, Saturday, my wife and I decided to kill some time (and some money) by spending a few hours at the show while Chris hung out with his grandfather. I found a good bit of stuff at the show for my set needs, which I will show off in a subsequent post. I also saw the above signed baseball for only $59 at a table of a vendor who I usually buy from. I bought Duke Snider from him a long time ago and I was really happy to be able to get this Richie Ashburn ball from him as well. Ashburn's signed baseballs typically run around $150 on ebay, so getting this one for $59 is a steal. The ball isn't authenticated, but I trust the seller and after looking at several Ashburn autos over the years, I have a good feeling that it is legit. Ashburn (b. 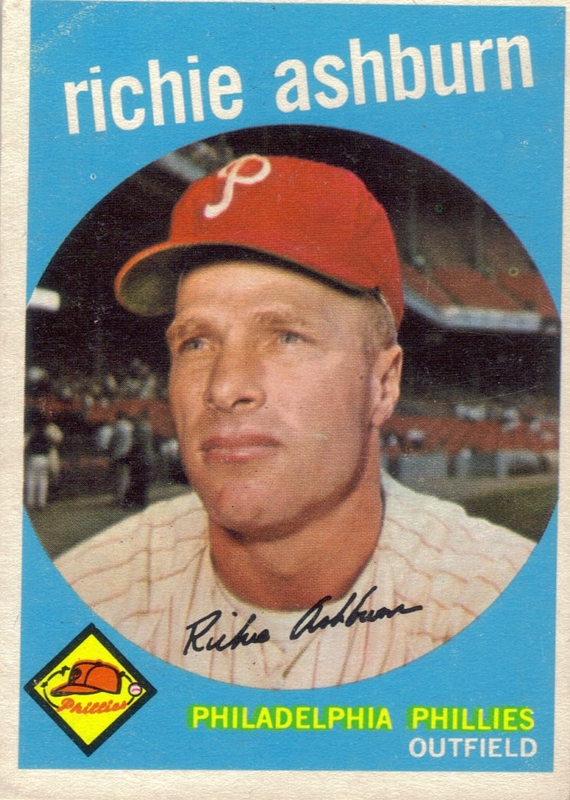 1927 - d. 1997) played in the majors from 1948 to 1962 for the Phillies, Cubs and Mets. 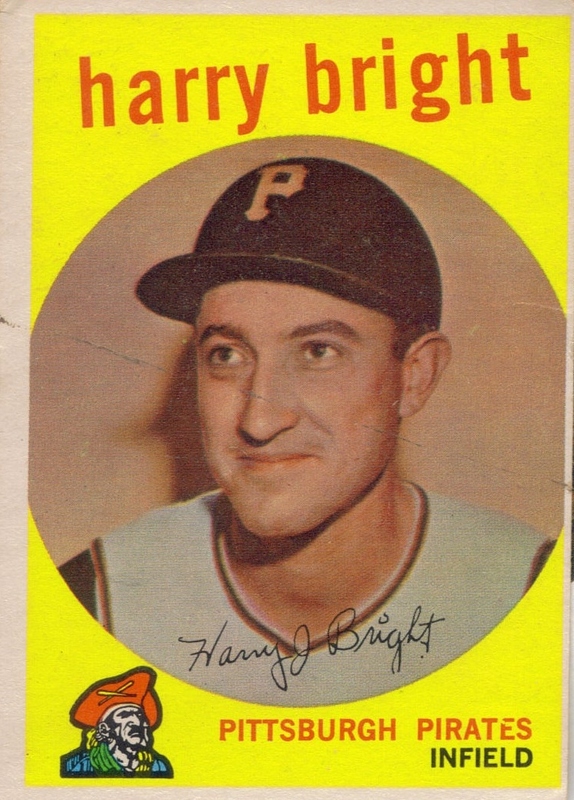 He had 2,574 hits, 29 home runs and a .308 lifetime batting average. 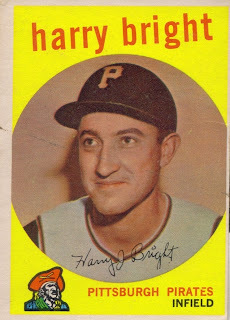 He had more than 200 hits in 3 seasons and won the NL batting title in 1955 and 1958. He was a part of the Phillies 'Whiz Kids' team that lost in 4 games to the Yankees in the 1950 World Series. Ashburn is my 91st Hall of Fame signed baseball. 100 seems to be creeping up on me. Gee, I wonder who #100 will be...?? Wow, I'm so ridiculously behind. It's a good thing though. I have gotten a ton of trades in the mail lately, and I also attended a card show. So, I have a ton of stuff to show off. I've pretty much ended my run talking about my vacation, except there may be 3 or so more posts that I want to do on it. However, since I am talking about trades, I will begin with the in person trade I made with Drew. You may have heard of Drew on this blog before. Maybe? Anyway, check out his blog as well. Because he's a great dude and a good friend. So, the first night I was at Drew's place, we busted a box of 2011 Lineage and then he gave me a huge stack of stuff he had been collating for me for quite some time. He also let me go through some album pages of cards that he had gotten in his amazing binder from a couple years ago. 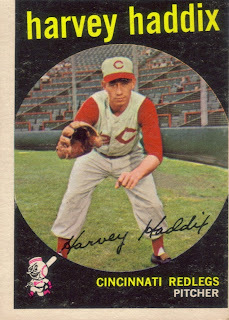 I needed the above Harvey Haddix for my 1959 set. 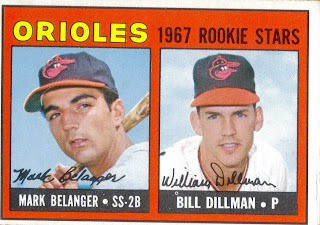 I grabbed this 1967 Topps Mark 'The Blade' Belanger RC for my Orioles collection. 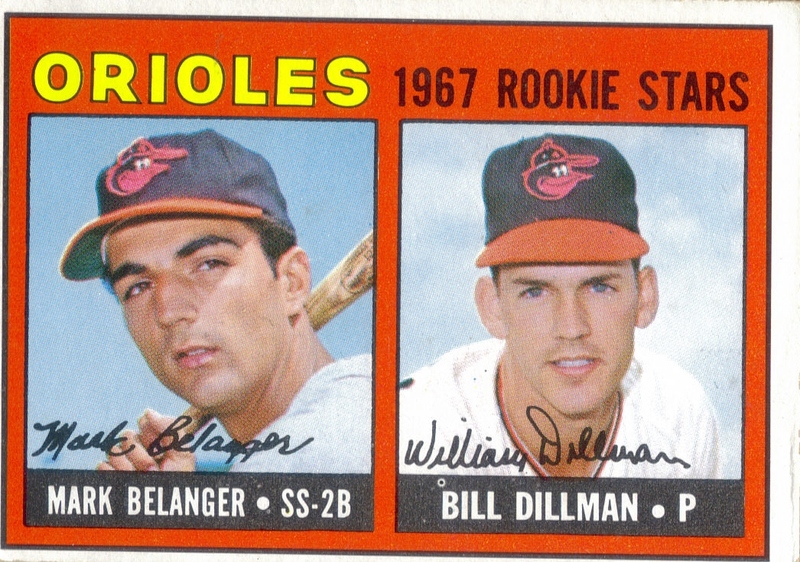 Belanger was a slick fielding shortstop for the Orioles in their 70's heyday. 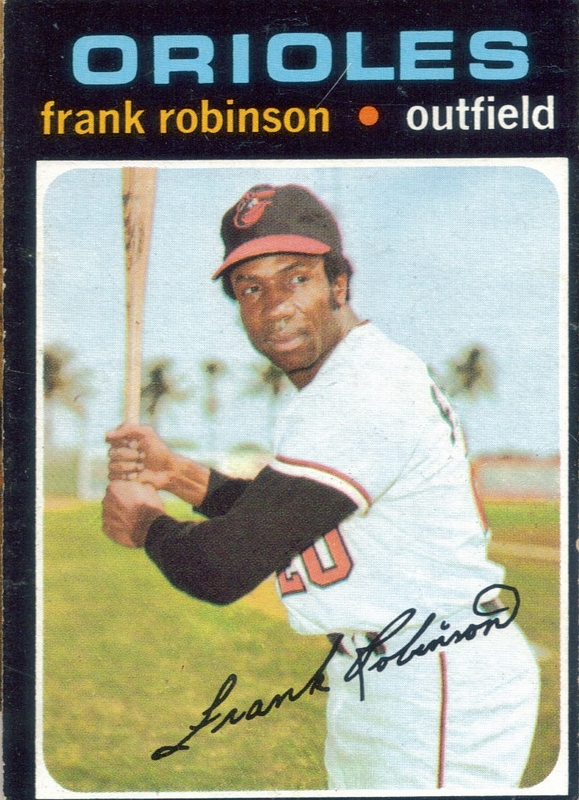 Ok, so, I have no idea how this card had eluded my 1971 set for so long. I could have sworn I had this card already. I need to check, but it was on my needs list. Maybe I had a beat up one that I wanted to upgrade. Anyway, Drew was nice enough to let me have it, and for that, I am thankful. This really is a cool card of The Splendid Splinter. His time in Washington was forgettable, leading to the theory that some great players just don't make good coaches. Drew threw in some nice RCs into my box as you can see with this 1973 Topps Goose Gossage and the below 1993 Topps Derek Jeter. Look how young Jeter is. Yikes! I'm feeling old! Yes, I am working on the 1993 set, but I have been lazy and haven't put my needs on my wishlist yet. I'll get around to it. We pulled off a trade for one of the relic cards in the Lineage box for the above 2009 A&G McLouth relic. Nate is becoming one of my favorite Orioles and I was happy to take this one off of Drew's hands. Finally, Drew threw in this cool coupon from Memory Lane, Inc. 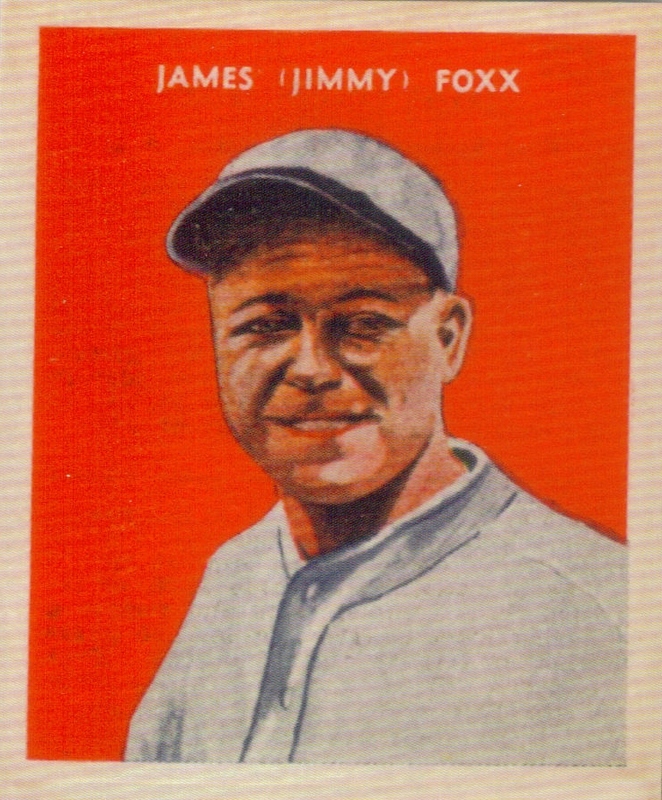 It is kind of a hideous portrait of Jimmie Foxx, but it will still go into my Foxx PC. So, thanks for all of the awesome stuff, Drew! I love this in-person trading. I would really like to do more of it. I guess I may have to consider a Foul Bunt World Tour for 2014. Haha. Stranger things have happened. The most important part of the Hall of Fame, to me, is the plaque room. That place, in my opinion, is hallowed ground. I always enjoy myself in there and was really happy to share the experience with my son. I walked him around and showed him several of the legends that he has heard me talking about. The first plaque we went to was Brooks, which can be seen above. Chris took this very unflattering picture of me in front of Brooks's plaque. He kept begging me to let him take a picture, so I finally relented and let him take one. Not bad. Then, of course, Chris wanted to have his picture taken in front of the plaque, so I obliged him, of course. With Chris being a huge fan of The Sandlot, he had to have his picture taken in front of Babe Ruth's plaque. Any self respecting baseball fan should have a picture of themselves in front of The Babe's plague. I'm just saying. He also had to touch Babe's bust as well. This will probably be a tradition for us, I think. A really nice lady offered to take our picture in front of The Babe, so we were appreciative of the gesture. When Chris then told her "Ok, you took our picture, now I'm going to take yours" I kind of freaked out, especially since she had one of those really awesome cameras. She was really nice and showed Chris how to operate it and he took the picture for her. Thankfully, he didn't drop her camera, which is what I was afraid of. Maybe I should start trusting him more? No, just by looking at that face, I know I can't trust him yet, haha. He was happy to have his picture taken in front of Cal's plaque as well. I read him Brooks's and Cal's plaques. 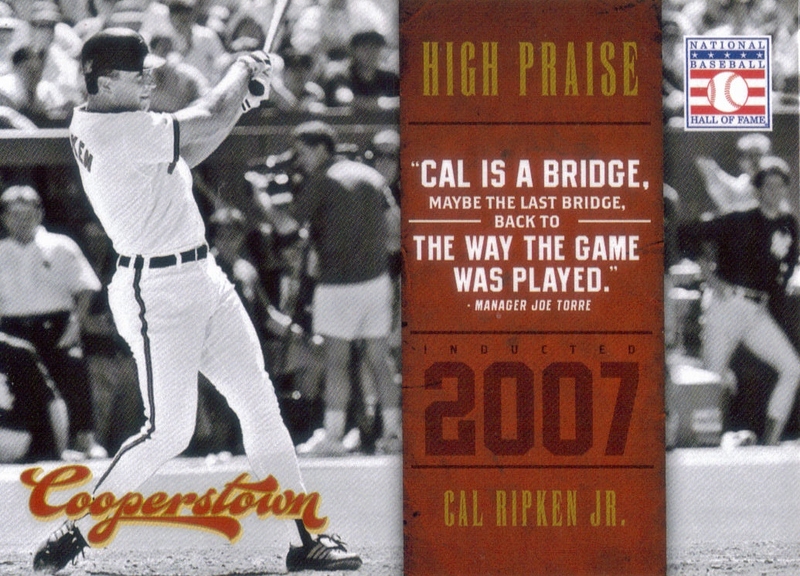 I did well reading Brooks's plaque, but when I read Cal's, I got a little choked up. You know, reading the Hall of Fame plaque of my childhood hero to my son... What an awesome moment. Then something really cool happened. The staff of the Hall of Fame closed off the section of the plaque room so that the plaques of the newly inducted Hall of Famers could be hung. I'm really excited to say that we were there when there guys' plaques were hung. That's so cool. While we were standing and waiting for the plaque hanging to be finished, we noticed that the great-grandson of one of the inductees, Deacon White, was right beside us. Jerry Watkins, White's great-grandson, accepted White's induction and gave a speech at the ceremony earlier that day. He was really nice to us, spoke to us for a little bit, then posed for a photo. I also thought this was really cool. Finally, Drew did something really awesome for me as well. I had no idea he was behind me taking this photo, but this is me reading Stan Musial's plaque to Chris. It really meant a lot to me that my buddy was able to catch this candid moment of me sharing this experience with my son. Thanks, Drew! First off, someone give the old lady in this picture a hug, please. She looks so pissed. I mean really. Was she surprised that someone was posing for a photo in front of the Hall of Fame? Really? Not only is she angrily photo bombing us, the old lady in the hat on the left side of the picture cut in front of us as we were trying to get another picture. She bumped into me and cut right in front of us, and clearly there was someone taking our picture. It caught me by surprise enough, that I couldn't bite my tongue and said really loud "Thanks a lot lady!" She didn't respond. Anyway, we were undeterred, we moved on into one of my favorite places in the world, the National Baseball Hall of Fame and Museum. I detailed my first visit to the Hall in a series of posts back in August of 2011, which you can start with here. I will spend this post showing a few new things and several pictures of Chris in front of some stuff. Chris had to pose in front of Pete Rose's jersey, since he is now a fan. There seems to be a bit of a groundswell of support for Rose getting into the Hall these days with the Biogenesis crap going on. I, for one, wouldn't mind if Rose's ban is lifted, but if his is, then the cases of Buck Weaver and Joe Jackson also need to be re-evaluated. Chris has been a Brian Roberts fan for as long as he has been able to comprehend baseball, so he was really happy to have his picture taken in front of the Orioles locker that had jerseys from Roberts and Adam Jones. Yeah, I had to take this picture since it is of a hat worn by Orange Crush himself. I love that it is from his game as a pitcher in May 2012 against the Red Sox. 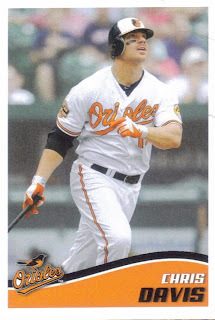 That has to be one of my favorite performances by an Oriole. I keep thinking back on it and am still amazed that he struck out Adrian Gonzalez and the O's squeaked out a win. I thought this was really cool, considering that I have this pennant hanging up in my Man Cave. Pretty cool that I have one and there is one in the Hall. Finally, I had to make sure I paused and paid my respects to the one and only Virgil Trucks when I saw the book of No Hitters that was on display. Being able to see his name on one of the items in the Hall brought a couple tears to my eyes and I was sure to point it out to Drew as well. He is the one who turned me on to Mr. Trucks and I will always be grateful. That being said, because we were there on Induction Day, the archives were closed, so I wasn't able to see my interview that I submitted a few months ago. You have to make an appointment to visit the archives and look at any of their documents. I was ok with this, though, because we really didn't have a whole lot of time to look into it. I know it's there, and have a certificate to prove it. So, stay tuned for a look at the plaque room and a unique experience that we shared while we were there.